My friend came over to my house the other day and commented on my picture frame mural I have going up the stairway. It’s a split level so you can see it from the door. Then she mentioned something about the crafting projects I’m always doing. Then I had to let her in on a little secret. This project, which still isn’t finished, is something I have been working on for a YEAR. That’s right. I had to collect the frames, paint them, put bracket things on them so they would hang, arrange them, put them up, re- arrange some and I still haven’t put pictures in them. Ok. I have a couple of pictures put up so I’ll show them to you. It’s probably my favorite part of the whole thing anyways. 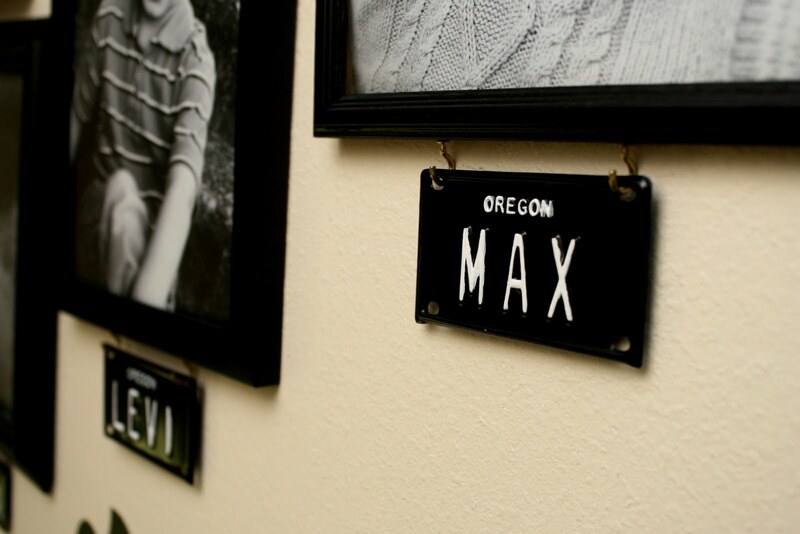 These are the most recent pictures of us with our personalized license plates beneath it. While I was on a trip to the beach I actually found plates for all of us which NEVER happens. Heck, I can hardly ever find my name, Kendra, and when I do, I buy whatever it is no matter what. It’s only happened 5 times. Ever. Levi? I think I’ve only found it once and Max never before this. So I knew I had to do something with them. For each of the license plates I spray painted them black and after they dried I hand painted the white letters. On the bottom of each frame I screwed in two hooks to hang them from. It’s pretty simple but I love it! I freaking love it!!!! So cute, stylish, hip, modern…. nice work!!! I love the license plates! What a great idea to paint them! Okay, I LOVE the license plates. I was just about to ask where you got just plain black and white license plates when I got the part about you painting them — genius! I can never find license plates with my name either. The only one I have was custom-made for me, so it's printed and not stamped. I love that you spray painted them! I really love the black and white look of the plates, very classy! Kendra – your mural wall looks classy and 100% custom. I know you said it is taking you a long time, but certainly it is worth it. I like the black/white theme.